The fall meeting, held at the Adirondack League Club, is the real highlight of our year and is very well attended by our members and their guests. The meeting starts on Friday evening with cocktails and dinner followed by our annual auction fundraiser….the auction is a fun and entertaining part of the meeting. Saturday morning following breakfast we hold a members meeting which features presentations and discussion on a wide range of Adirondack issues affecting private landowners. Many ALA members come early to this event to enjoy some of beautiful scenery and outdoor activities. This is one event you don’t want to miss. The spring meeting is typically held at Minnowbrook Conference Center. Based on feedback from members, we're trying a one-day meeting format for the spring meeting, with the meeting beginning at 10 AM, lunch at noon, and the meeting concluding at 3 PM. The 2018 ALA Spring Meeting was held at Minnowbrook Conference Center on Saturday, May 5, 2018 from 10AM to 3PM. This was a change from previous years where the spring meeting involved a Friday afternoon arrival, dinner, then morning meetings. Turnout for the meeting was quite good with approximately 30 people making the pilgrimage to Blue Mountain Lake. Speakers included John Bartow of the Empire State Forest Products Association (ESFPA), Ross Whaley, and ALA Counsel Kim Finnigan. A major focus of the meeting was a discussion of the “Conservation Subdivision” bill, introduced in the NYS Assembly as A5451. The ALA, along with many other Adirondack stakeholder groups including environmental groups, local government, and ESFPA, participated in numerous meetings to discuss and revise the bill. The proposed legislation is of keen interest to the ALA because both the Adirondack League Club and Brandreth Park recently went through the large-scale subdivision planning process so they could accommodate growth, and other members of the ALA will surely need to do the same in the future. The ALA participated in the discussions to help ensure that proposed regulations were reasonable and didn’t include excessively costly and onerous requirements. As of the May meeting, the draft bill still included provisions that the ALA felt were unacceptable, such as a requirement to identify dead standing and down trees in areas that would not be developed. While these are important, but temporary, habitat features that it would make sense to identify in areas that are going to be developed, forcing landowners to conduct on the ground surveys of such features in areas that are not going to be developed seems to be a prime example of something that would impose great costs while providing very little benefit. At the end of session in June, no action was taken on A5451, but it seems likely that the issue will be raised again. 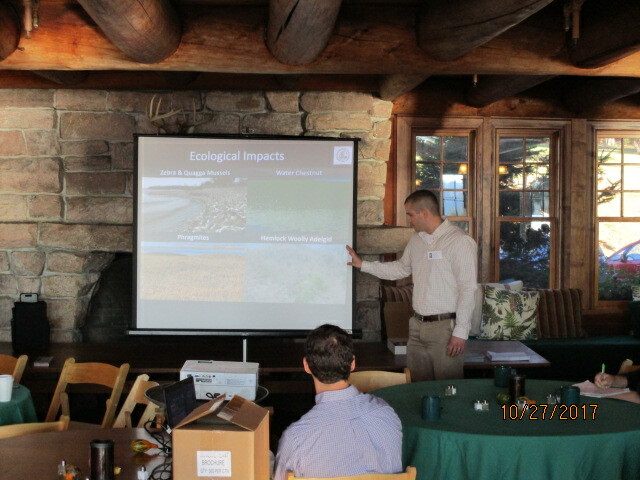 The annual spring membership meeting was held at Minnowbrook Conference Center on May 5th and 6th. Minnowbrook is a great setting and the folks there, really go out of their way for us. Prior to the meeting a number of our members enjoyed a tour of the Adirondack Experience [formerly the Adirondack Museum]. We had a great turnout for the Friday night reception and dinner as well as the Saturday morning meeting. Friday evening was a memorable gathering…great food and conversation along with some interesting after dinner discussion. We were honored to have a number of Adirondack officials in attendance including; Assemblymen Marc Butler, Bill Jones and Dan Stec along with Senator Betty Little. Also in attendance were Bill Farber, Fred Monroe and Sherman Craig. Our guest speaker on Friday night was North Hudson Town Supervisor, Ron Moore. Ron talked about the new Exit 29 “Gateway Project” that is being developed in his town. NYS is planning to invest $32 million dollars to create a new tourist camping and recreational complex. The Saturday morning meeting presentations focused on forestry related issues. Our first speaker was Rob Davies, NYS DEC Director of Lands and Forests. Rob was followed by Tom Gillman of F & W Forestry and Tom Bielli, District Conservationist for the USDA. All three speakers presented important information on private forestry and stewardship practices which was well received by our membership. This was followed by the members only portion of our meeting during which our Senior Advisor, Ross Whaley gave a detailed report on a number of important legislative issues facing the Adirondacks. Additionally, we welcomed 4 new associate members to the ALA. Overall the meeting was successful, well attended and informative. The ALA will meet again the last weekend in October, 2017 at the Adirondack League Club. Read about previous ALA membership meetings. Town of Newcomb Supervisor, George Canon receives a special tribute from the ALA in recognition of his retirement. Some smiling faces enjoying the evening festivities. George Canon shares some thoughts on his 25 years of public service to the Adirondacks. Peter Walke, Assistant Secretary for the Environment, speaks to the ALA members following dinner. ALA Vice-President, Neil Skotarczak, leads one of the discussion groups at our Saturday morning meeting. Scenes from the Winter 2015 Membership Meeting. The ALA Spring Meeting will be held in Blue Mountain Lake at the Minnowbrook Conference Center from 10:30 AM to 3:00 PM. In addition to the regular updates, we’ll have two presentations that should be of great value to members of the Adirondack Landowners Association. General Managers Egan Willard of the Adirondack League Club, and John Schuler of the Ausable Club, will speak about all of the aspects of running their multi-faceted organizations. Items such as recruiting, and managing all employee related issues, communication and utility issues, timber management and sales, state and local relations and permitting, public access easements, water and sewer issues, aquatic and land invasives, fishing, shooting and hunting issues, assessments, as well as property and school taxes, club house and problematic member issues, and any other annoying challenges. Troy Weldy, who is the Director of Ecological Management for The Nature Conservancy, will speak about the Working Woodlands program, which helps landowners develop and market carbon credits. Landowners with 2,000 acres or more are eligible. A question and answer session will follow, including with ALA members who have gotten involved with the program. Please join us. Simply print out the reservation form and mail it in. The meeting has been scheduled to also provide you with a good excuse to make it to the Adirondacks in early spring, and get to your camp for the weekend. The Adirondack Landowners Association held its fall meeting on October 26th and 27th at the Adirondack League Club in Old Forge. Weather was typical for late fall, which is better than typical for early winter when the end of year meeting was often held! On Friday afternoon, the board had an enlightening discussion with Bill Farber of the Hamilton County Board of Supervisors regarding a number of issues. One was the dynamic in Albany with respect to the Adirondacks, and how it might change if the Senate flips from Republican to Democratic control, as it now has. Another was the potential role for the ALA given that it is composed of landowners with diverse perspectives. The meeting officially began at 6 with what was listed on the agenda as “social hour.” ALA meetings provide the opportunity for informal conversations among Adirondack landowners regarding issues of common interest, as well as with invited guests from the Adirondacks and elsewhere. For some, these conversations are the main reason they come to the meetings. Attendees included members of the Adirondack League Club, the Wilmurt Club, the Ausable Club, Brandreth Park, the North Woods Club, Livingston Lake Club, the Hollywood Club, and McCavanaugh Pond Club, among others. Guests included Fred Monroe of the Local Government Review Board, Bob Stegemann of DEC Region 5, Peg Olsen of the Adirondack Chapter of The Nature Conservancy, Randy Young of DEC Region 6, Matthew Simpson of the Adirondack Association of Towns and Villages, Ronald Moore, the Supervisor of North Hudson, and Bill Farber, Chairman of the Hamilton County Board of Supervisors. The conversations continued through lunch the next day. Later in the evening, Fred Monroe, who has been involved with the ALA since it was founded in 1990, was honored for his service to the Adirondacks. Wilbur Rice presided over the live auction, where the “big ticket” item was a cruise on Narragansett Bay in Rhode Island, which broke recent records. After dinner, Peg Olsen of the Adirondack Chapter of The Nature Conservancy gave a presentation on how the Adirondacks, and private land, fits into the larger ecological context in the northeast. Getting ready to go fishing on Friday afternoon. Brendan Quirion presenting on Saturday morning. The Adirondack Landowners Association held their annual fall meeting recently at the Adirondack League Club. We were lucky to have some pleasant fall weather along with a great meeting and auction. We were very fortunate to have Venetia Lannon, Deputy Secretary for the Environment be part of our two day event. We started Friday with a tour of the Cornell Research Facility which is located at Little Moose Lake. Venetia and others learned about the 60 plus year history of coldwater fisheries research that has been done by Cornell in partnership with ALA members, most notably the Adirondack League Club. Many thanks to Dan Josephson for providing a first-rate experience. From there we visited a recent timber harvest location on the ALC property, where the ALC’s Forester, Kevin Virkler, explained the many aspects of scientific forestry to the tour participants. We were joined on the Friday outing by Brendan Quirion, Program Manager for the Invasive Species program at the Nature Conservancy. Brendan and his co-worker Zack Simek helped to educate folks about certain invasive plants and how to prevent their spread or treat infestations that occur. Friday evening was a busy time…we held our annual auction event where folks could bid on a wide variety of Adirondack items and other interesting gifts. We had a nice social hour followed by dinner and then a presentation of the ALA Stewardship Award…this year’s recipient was our own Dr. Ross Whaley. Ross has been a fixture on the Adirondack scene for many years with a long list of accomplishments and contributions…he was certainly deserving of the Stewardship Award. We were also honored to have Venetia Lannon address our members after dinner and share some thoughts on her experiences on Friday and her appreciation for the stewardship role played by our members in the Adirondacks. We had a number of special guests including NYS Senator Betty Little, APA Chairman Sherman Craig, DEC Region 5 Director, Bob Stegemann, Fred Monroe, Executive Director of the Adirondack Park Local Government Review Board, Matt Simpson, new President of the Adirondack Association of Towns and Villages, Ron Moore, Supervisor from North Hudson, Steve Hamilton, Inspector General for the NYS Comptroller, Ed Griesmer, Executive Director, Adirondack Lakes Alliance, Tony Wilkinson, DEC Director of Fish and Wildlife and Eric Siy, Executive Director for The Fund for Lake George. Our Saturday morning meeting featured a presentation by Brendan and Zach from APIPP about their work on invasive species, Fred Monroe talked about the Land Bank amendment, John Bartow, head of the Empire State Forest Products Association spoke about the Empire Forests for the Future program and the long awaited 480b forest tax law. Tony Wilkinson rounded out the morning wit information about DEC’s efforts to prevent the spread of Chronic Wasting Disease [CWD] in the whitetail deer herds of NYS. This was followed by the membership business portion of our meeting and a delicious lunch. The ALA spring meeting is scheduled for the first weekend in May 2018 at Minnowbrook Conference Center in Blue Mountain Lake.